I've been reading a bit about the different layers of the cerebral cortex and its clear that certainly not every region of the cortex has the same number of layers. Thus, the idea that every region has six-layers is clearly false. And I think this fact is definitely well known. Do neuroscientists still view the six-layer model as an accurate model? If so, what aspects of it have changed over time that now incorporate the fact not every region has six layers? See The Microcircuit Concept Applied to Cortical Evolution: from Three-Layer to Six-Layer Cortex by Gordon Shepard for more. The layers in the cortex are histologically and functionally defined. Both 3- and 6-layered cortices are found in the human brain. Hence, the different cortical layers are not models, but classifications based on empirical observations. Fig. 1. Layered cortex. Source: What-When-How - Neuroscience. 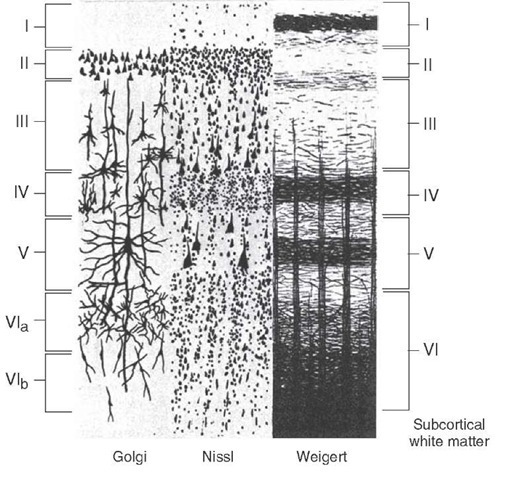 As one can see in this picture, layer VI can be divided histologically into 2 sub-layers, namely VIa, containing mainly pyramidal cells, and VIb with mainly horizontal cells (Prieto & Weiner, 1999). Hence, a 7-layered cortex could be argued for as well - it is all kind of subjective. The functions of the 6 layers are illustrated in Fig. 2. Fig. 2. Functions of the 6 layers. Source: Free-Stock-Illustration. 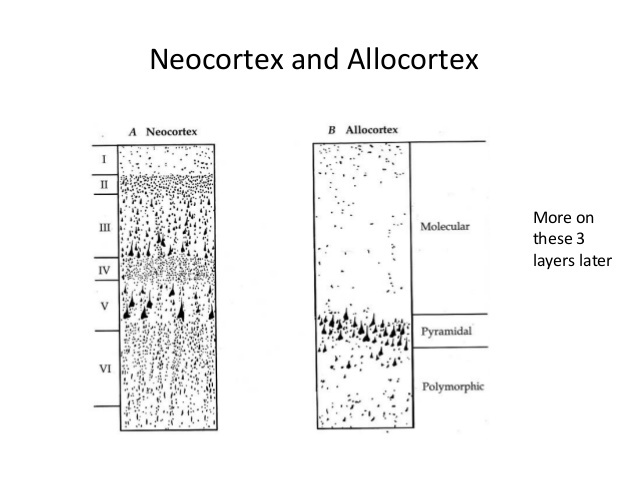 However, the primary olfactory human cortex (the paleocortex) contains only 3 histological layers, as opposed to the 6 identified layers in the neocortex (Fig. 3). The primary olfactory cortex is part of the allocortex in man. Fig. 3. Neocortex versus paleocortex. Source: Slideshare. The primary olfactory cortex receives direct sensory input from mitral cells in the olfactory bulb in the outermost layer Ia. layers Ib, II, and III receive input via local and long-range intracortical connections. Sensory and intracortical inputs converge in layers II and III. The three-layered palaeocortex is different from the six-layered neocortex in sensory areas. In the neocortex, sensory and intracortical microcircuits are distributed to two different layers. Sensory inputs from the thalamus target layer 4. Layer 4 subsequently projects onto layer II/III, which distributes and receives intracortical associative fibers. Note that the olfactory system is exceptional in that it does not relay its information via the thalamus, explaining the absence of layer IV (Wiegand et al., 2011). Reptilians and birds typically have a 3-layered cortex (Nauman et al., 2015). Not the answer you're looking for? Browse other questions tagged neuroscience brain neuroanatomy or ask your own question. Is the motor cortex identical to the sensorimotor cortex? 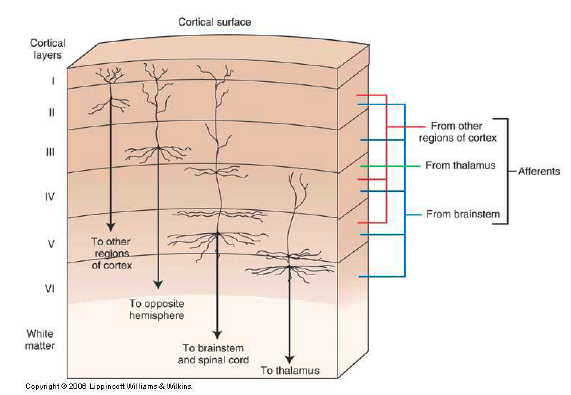 Are there axon branches that go up to cortex layer 1 and spread there? Why are the posterior and anterior inferior temporal cortex called area TEO and area TE respectively?